A home security system will provide added safety to any house and will help deter breaks-ins, home invasions and vandalism. Security equipment is always in great demand, as more and more people do their very best to safeguard their families and property from potentially damaging criminal activity. 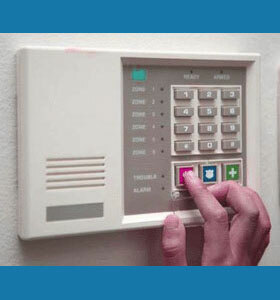 This guide provides a detailed look at home alarm systems and installation. We will explain the benefits of a security system, as well as warn of common pitfalls that can compromise the effectiveness of the device. A basic home alarm set up will help prevent burglary and detect problematic occurrences in the dwelling, such as fires and gas leaks. Advanced features may include monitoring and recording of interior and exterior property features and even the ability to check on interior conditions, such as temperature and air quality, to safeguard pets which may remain behind when you are away. Basic security sets-ups will include sensors on all windows and doors to report unwanted or forced entry. Sensors will also monitor smoke alarms and gas leak alarms. All these sensors tie in to a control panel, which links to a central station monitoring company. Advanced security systems may include exterior surveillance cameras and interior hidden cameras, also known as nanny cams. All home alarm system equipment should be installed and serviced by a qualified expert in private security. Monitoring should be hired out to reputable companies which do not show a history of problems with local law enforcement or The Better Business Bureau. It is vital to make it difficult for criminals to void the effectiveness of your system, by making components difficult to access and making sure every system has a fail-safe mechanism. The best way to do this is to mount all exterior cameras and components in places which are virtually impossible to access, without specialized equipment. Make sure your system has a back-up phone line to dial the central station. This secondary line should be hidden and not near the primary line. This way, criminals can not simply cut one wire and make your security system impotent. A quality battery backup is also a good idea, in case of power outages or purposeful tampering with your electrical supply. Home security is a niche sector of private investigation. Many companies offer this service exclusively and can provide excellent protection at a low cost. Likewise, many companies install basic systems for free, if you are willing to sign a central station monitoring contract for a given length of time. Advanced features are likely to be provided at an additional fee, but these items can help reduce your home insurance premium a significant amount. Monthly monitoring must be maintained for a security system to really work. If you simply have the components with no one monitoring for trouble, the system is a bluff, at best, and a waste of time and money. Do not waste your efforts with easily defeated amateurish security set-ups and do not rely exclusively on a firearm in the home or a guard dog. Firearms are not useful in every scenario and can become a huge liability for many homeowners. Watch dogs can be deceived or even poisoned, which is a common tactic of many professional thieves. For detailed information about installing a home security system to protect you and your real property, contact a security consultant or professional investigator.